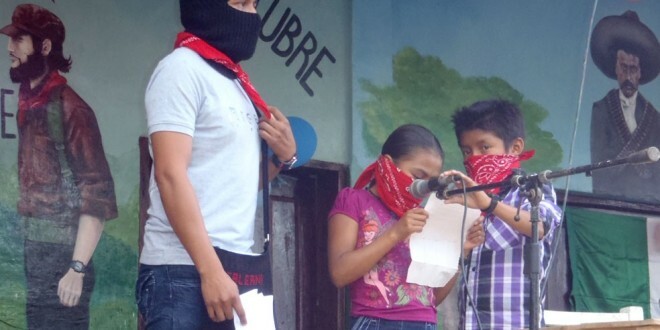 The words of the EZLN’s General Command in the voice of Subcomandante Insurgente Moisés in the Zapatista community La Realidad at the presentation of the “Compañero Galeano” Zapatista Autonomous School and the October 26th “Subcomandante Insurgente Pedro” Autonomous Clinic to the Zapatista support bases on March 1, 2015. Good morning to everyone, compañeros and compañeras of this zone, in this Caracol of La Realidad, Border Jungle Zone. We are here with you today, compañeros, compañeras of this zone, to officially turn over these buildings to the compañero and compañera bases of support of this Zapatista community, La Realidad, Nueva Victoria, as we call it in our struggle as the Zapatista National Liberation Army. This construction was the fruit and the work, the efforts and the organization of the compañeros and compañeras of the National and International Sixth. Here we are demonstrating what we Zapatistas are, in Mexico and in the world. The work of the capitalist system is to destroy what the poor people build. But the poor people will not stop building, because it is their life. The system destroys what the people build because it knows that one day the system itself will be destroyed, because it is based on exploitation and humiliation. Capitalism does not build life, and it leaves us, the poor, with nothing. All we have is what we build ourselves, we men and women who struggle, not anyone else. That is why we are stating what we are, here at the construction site, here in the community of compañero Galeano, teacher of the Zapatista Little School, sergeant in the struggle, miliciano  in his organization, authority in his own life, an example for all of us. We want to say clearly here in this community, for those who are not on our side: we are not against them. We want respect; they know that. And we have said: if they respect us, we will respect them; we are not here to kill poor people. But if they let themselves be used by the system, they know that they are on the side of the criminal, the exploiter, the murderer; that is, capitalism. We want to say clearly and make absolutely clear: we don’t have anything against our brothers, those who want to be brothers to those of us who are in struggle. Whether they want to [struggle] or not, it’s no problem either way. But just like we say there is no problem, we don’t want them to give us any problems. The person that goes looking for problems finds them. And when we say this – that those looking for problems find them – it is also true for us as Zapatistas. It is true for anyone who provokes conflict. That is why we are saying clearly here: we are not going to cause problems, because we don’t have anything against those who don’t want to struggle with us. Here we are demonstrating how when poor people organize themselves, the capitalist system is unnecessary. A system that dominates and humiliates is not necessary. Here, in practice, is an example of this fact. Capitalism, the bad government of this country, ordered the destruction of the autonomous school belonging to the Zapatista support bases. And they did destroy it – as destroying things is easy – just like they destroyed the community’s health clinic, as it is (inaudible). And here is the result, the result of the strength and the organization of our compañeros and compañeras of the national and international Sixth. What the poor people of Mexico and the world re-built came out even better than it had been before. We want to make this clear, that we have to support other compañeros and compañeras, not only those who live in the Zapatista zones, but other compañeros who are missing. There are many things that we want to say compañeros, which is why, for the next few days we will work here with you. Right now we are here to turn over to the compañero support bases of the Zapatista Army the building that our compañeros and compañeras of the Sixth have given us. But he isn’t here and we know who is responsible, and the question that we put to those responsible (for what was done to compañero Galeano) is how many millions of pesos did the people who you killed owe to you? What did compañero Galeano steal from you to make you do what you did? The people who did this can’t answer these questions because the truth is that he didn’t steal anything from them. He never stole anything from them or owed anything to them. In fact, they owe us. That is why we are here asking them to listen, to open their hearts, to use their heads and think about this. There isn’t anywhere to go. Even if they flee this place, they will encounter the same death wherever they go. It makes more sense to be here, to live here and respect each other here as people, as Christians, as they say. This is something that even our animals understand, and they are just animals. We are not animals; we are men and women, boys and girls, with brains. And so, compañeros and compañeras of this caracol of La Realidad, in the name of the compañeros and compañeras of the national and international Sixth, I turn this building over to you, for the good of our compañeros and compañeras of this community, La Realidad, so that the compañero and compañera health and education promoters can begin to do their work. We just want to make clear that this building belongs to all of us, and so those above should think about whether they want to try to destroy it again. But we also want to say to the people from this village, let the bad government come destroy it if that’s what they want. Don’t allow yourselves, señores and señoras, to be used; don’t let the bad government use you to destroy this because you are poor people just like us, you know that. Don’t let them use you, don’t sell out, because life cannot be bought and sold. Let the bad government come and do it. What about those verses in your church or temple, the ones that tell you to love others? How does that fit in? Think about it, señores and señoras, don’t be like the bad government that says one thing and does another. Don’t be like that, señores and señoras. What’s it worth to preach one thing and do the opposite? We don’t want to do this, to say one thing and do another. As we say, we have compañeros and compañeras who are with us in struggle, and it is because of that that we are able to turn this building over to the community today, March 1. So with that, I formally turn this building over to the support bases, today, Sunday March 1, 2015, at 10:34, southeastern time. Many thanks, compañeros and compañeras! – It is not the same thing to search for a divine man to save us as it is to organize men, women and others  to collectively save ourselves. To delegate to someone else what is your own responsibility is, to say the least, irresponsible. The text uses “otroas” meaning “others,” to give a range of possible gendered pronouns including male, female, transgender and others. If you click on the above link, there are photos of the inauguration. They enlarge if you click on them.